With solar now the cheapest form of energy, decentralised renewable energy generation is regarded as a key solution to the massive global challenges of climate change and energy poverty. Unfortunately, financing is still a major roadblock, especially in developing countries, and for schools, businesses and communities that need small- to medium-sized projects. To overcome the financing obstacle, we created Sun Exchange, a micro-leasing market place which connects people who want to invest in solar energy with people who want to access it. Our marketplace combines sharing economy principles with the borderless, frictionless nature of the crypto-economy to make solar power and its economic, social and environmental benefits more accessible and inclusive. Through the Sun Exchange online platform, we host crowd-sales for solar panels that will go on to power businesses, hospitals, schools and other organisations in developing countries. During a crowd sale, anyone, anywhere in the world with an internet connection can purchase solar cells for as little as ~$10.00 per cell, and then lease them to be installed in remotely-located solar plants, where they are then installed by one of our solar installation partners. The solar power plant is leased to the electricity off-taker (the school/business/organization, etc. where the solar project is installed) for a period of 20 years, guaranteeing lower energy costs than their alternative for the whole term. Sun Exchange's proprietary software platform ‘Proxima’ (a software- and technology-enabled solution for scalability) administers the lease payment rental and distribution back to the solar cell owners. Solar cell owners receive the lease rental payments, paid optionally in fiat or Bitcoin, while off-takers enjoy the benefits of cheaper, clean energy installed and generated at no upfront cost. Off-takers - Organizations, communities and individuals who benefit from installing solar, at no upfront cost with guaranteed energy savings. Solar Cell Owners - Individuals and institutions who benefit from buying into a Sun Exchange solar project crowd sale. Currently we have 6500 Sun Exchange solar cell owners across 90 countries. Practically anyone with an internet connection, anywhere in the world, can purchase solar cells during a Sun Exchange crowd sale and then benefit from the rental income stream the solar cells generate. 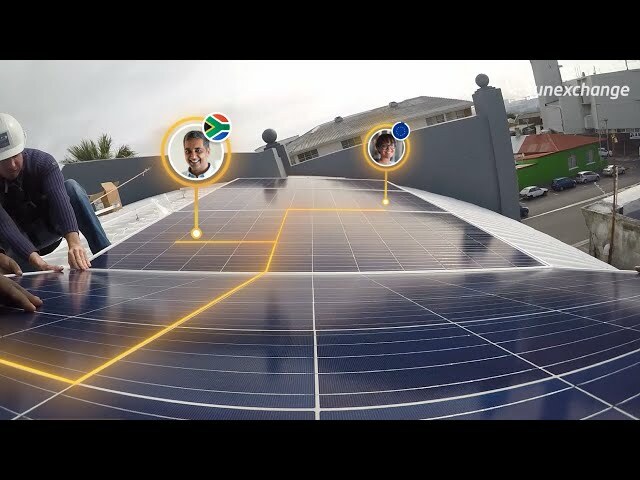 In terms of off-takers, currently we are focused on serving businesses, schools, NGOs, hospitals, and other such organizations in South Africa that can benefit from the cost and carbon savings of going solar through Sun Exchange. Our ambition is to also serve the ~600 million people and their communities in Sub-Saharan Africa who live without energy access. Lowering energy costs for businesses helps provide assurances for jobs or create new jobs. For example, the energy cost savings to our most recent project at Sacred Heart College, a school with over 1000 pupils, exceed ZAR3.3 million (~USD250k) over the project lifespan, savings which can provide bursaries to underprivileged pupils and improve educational facilities. To date, we have facilitated funding for seven solar projects across South Africa, with a total capacity of 340 Megawatt hours (MWh) of solar power. This includes two schools, two wildlife protection parks, two factories and an environmental NGO. These organisations have all gained access to solar energy, which they would not have been able to afford otherwise, and which significantly reduces their electricity costs and carbon footprint. Additionally, 6500 Sun Exchange members (solar cell owners) across 90 countries are earning an income from the electricity generated by their solar cells. Every kilowatt hour (kWh) of electricity produced by our solar projects offsets 1kg of CO2. To date, the 340MWh produced by our solar projects offset 340 tonnes of greenhouse gas emissions. Every kWh we supply also saves the end consumer approximately ZAR 0.30 (USD 0.022c).